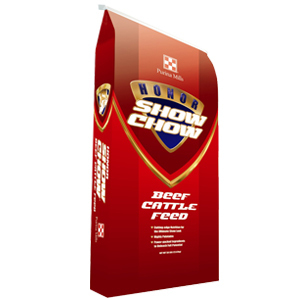 Honor Show Chow Fitter’s Edge feed is a coarse-textured sweet feed. This is a complete, balanced diet formulated for optimum growth and development of show cattle. It can be followed by feeding Honor Show Chow Finishing Touch feed. Fitter’s Edge feed is supported by Purina Mills knowledge, experience, and research. It’s never too early to start thinking Winner’s Circle. Get your best animals on Honor Show Chow Fitter’s Edge feed today so they can reach their full potential. The Winning Matrix™ Efficient production requires a thorough understanding and application of the fundamental principles of good husbandry and sanitation. The Purina Mills® The Winning Matrix™ program will help you step into the spotlight. 1.GOOD BREEDING: Practice a sound genetic program of selection and culling. Visit a professional breeder for more information. Know the feeling when you have that perfect animal that has the best potential to win. 2.GOOD FEEDING: Proper nutrition for different needs and lifestyles starts with Honor® Show Chow® products. Feed at regular times at least two times daily, with three daily feedings preferred. You can’t become a Grand Champion without the best nutrition. 3. SOUND MANAGEMENT: A clean environment minimizes stress and improves average daily gains. Clean stalls, remove debris and provide fresh water daily. The daily attention to detail is the difference between a Grand Champion and lower placement. 4.PREVENTIVE HEALTH: Establish an effective health program with your local veterinarian. A sick animal never makes it to the top. These are the building blocks of the Honor® Show Chow® program and the keys to successful production. Practical application of these basic principles will not only enhance your animal’s growth and development, but also increase its potential of winning on the show circuit. Caution: Store in a dry area away from insects. Do not feed moldy orinsect-infested feed. This feed is designed for show cattle under 900 pounds, but may be fed to cattle of any age or weight with proper management. Developing show cattle should eat approximately 2.5-3% of body weight and should be fed hay free-choice. Frame, genetics and management will determine finishing period. Forthe medicated option, feed 15 pounds per head per day to growing cattle to provide 70 mg chlortetracycline. Important: This product is to be fed only to the animal species as directed on the label Follow these management practices: 1. When making a ration change, allow 7-10 days for animals to adjust to the new ration. 2. Provide a source of fresh, clean water at all times. 3. Do not allow fine material to accumulate in feeders. 4. Provide adequate, well-protected and well-managed bunk space for each animal to prevent feed from becoming wet and moldy. 5. When fed from a self-feeder, adjust feederto minimize quantity of feed accumulating in trough. 6. Cattle should be vaccinated against enterotoxemia. 7. Consult your veterinarian forthe recommended health program for yourlocal area. This includes internal and external parasite control. 8. Provide plain salt and Purina Wind&Rain® All Season mineral free choice. In groups of cattle, there are certain animals that experience chronic bloat or other digestive disturbances, and consequently are poor performers. In addition, excess feed consumption, severe weather changes resulting in erratic feed consumption and poorly-managed feeding practices can increase the incidence of bloat in all cattle. If bloating does occur, the above management practices should be reviewed.